Pull files from GitHub and create pull requests from Lokalise. Use this integration to exchange files with your GitHub repository. As soon as the integration is set up, you can pull the files by using the Lokalise web dashboard. There will be also an incoming webhook set up, which you may use to automatically pull the files as they are pushed to GitHub by your developer team. Once the translations are done, you can trigger the creation of a pull request when exporting. Navigate to project settings > Integrations and click Connect under the GitHub badge. 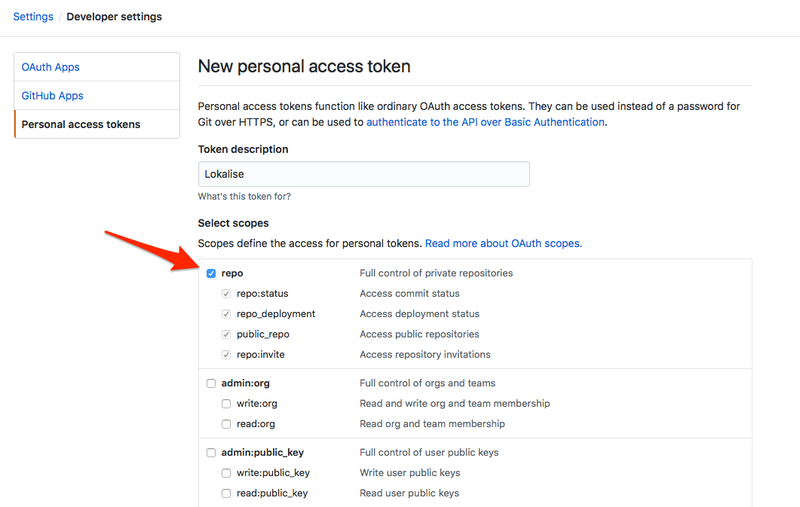 You will need to generate and copy/paste a personal access token from GitHub. The token must have repo scope enabled. You must specify the platform of the files stored in this repo. 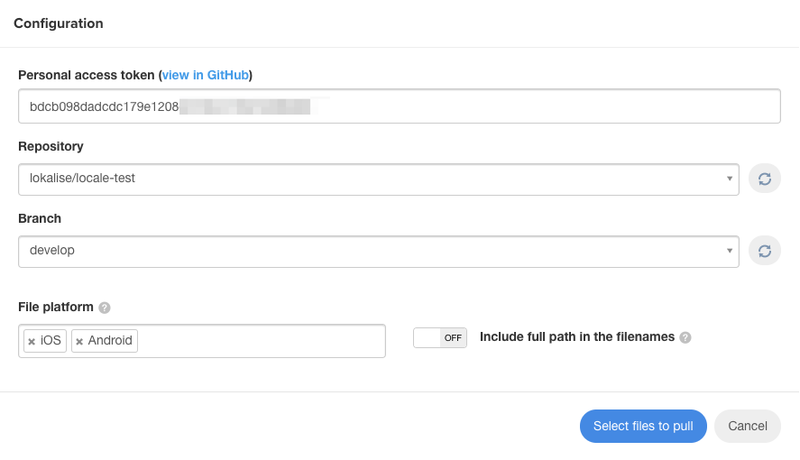 As you export files from Lokalise, you can trigger the GitHub integration to create pull requests to repositories with a platform related to the exported file format. Browse the selected repository and select the files you want to pull and import. 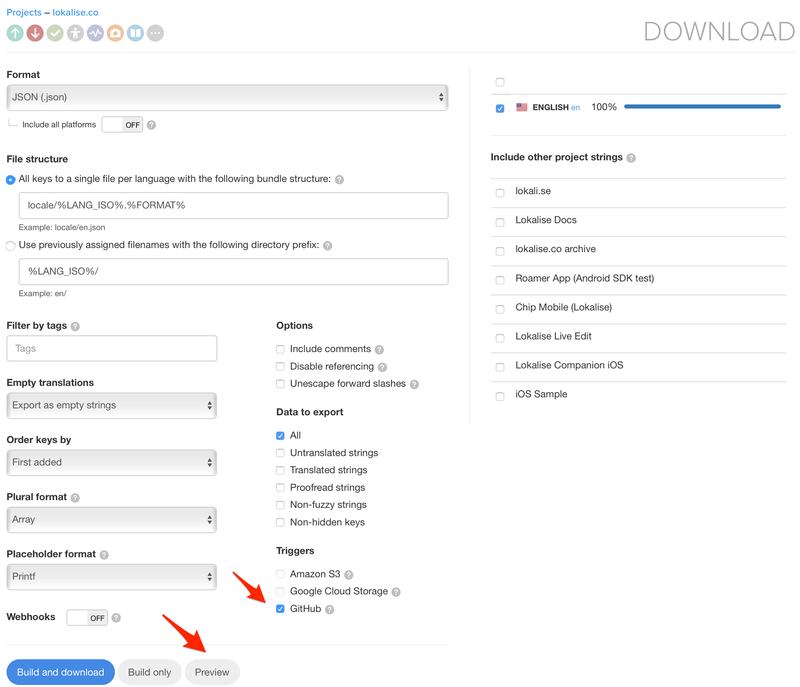 In most cases, at this step you would only need to select the base language files (the files that are being modified locally and then pushed to GitHub). After selecting a file, you must set the language of the file in the dropdown. 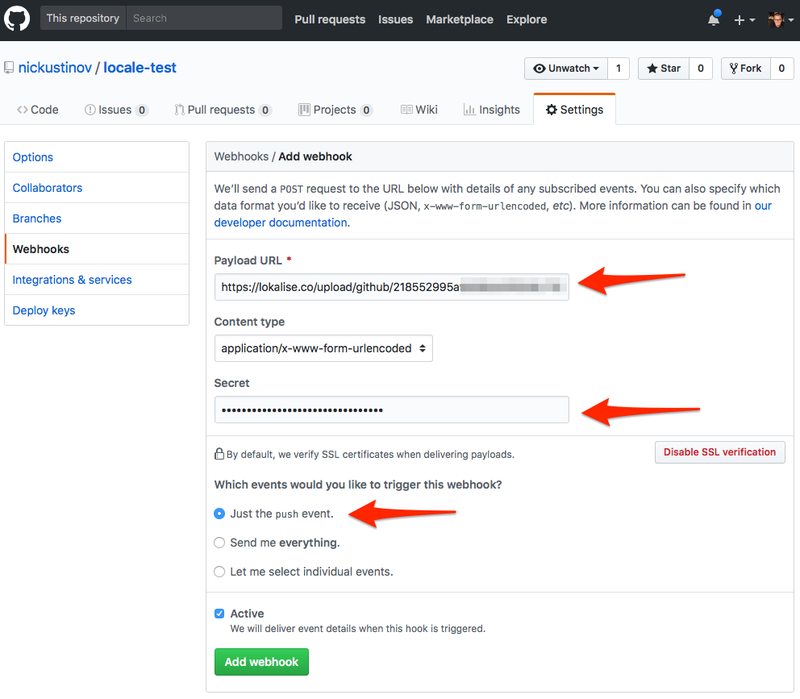 When you are satisfied with the initial pull results, it is a good idea to set up a webhook at GitHub which automates pulling the changes to Lokalise as you push to GitHub. At GitHub, navigate to your repository settings > Webhooks and copy/paste the Auto-pull URL provided in the Lokalise integration config. You will need to provide the Auto-pull secret generated at the integration page as well. In order to create a pull request, you need to perform a project export with the GitHub trigger enabled. It is a good idea to use the Preview button first, so you can see the resulting file/folder structure before triggering the creation of a pull request. You may then review and merge a pull request at GitHub. To initiate a pull request from the API, use triggers=['github'] parameter with the /export endpoint. If you are using the CLI tool, use --triggers=github as a parameter when performing the export. How is my access token stored? Your token is stored in an encrypted form in our database. The database itself is stored on dedicated servers located at Hetzner Online provider, which ensures top-level physical security (read more here https://www.hetzner.com/pdf/en/Sicherheit_en.pdf). We make regular snapshots of the database and store them in a 256-bit encrypted Amazon S3 bucket for 30 days.